From 2002 through 2006 I drew and made prints. In 2007 I began a serious and regular painting practice which has remained a relatively private one, allowing me freely experiment and explore with out feeling pressure. As I've matured as a painter, I've grown to see painting as an investigation in to visual and personal relationships: between Self and Other, Painter and Viewer, between the Painting and Process....I'm often reminded of friends and family while working and have found the results can be personally instructive. 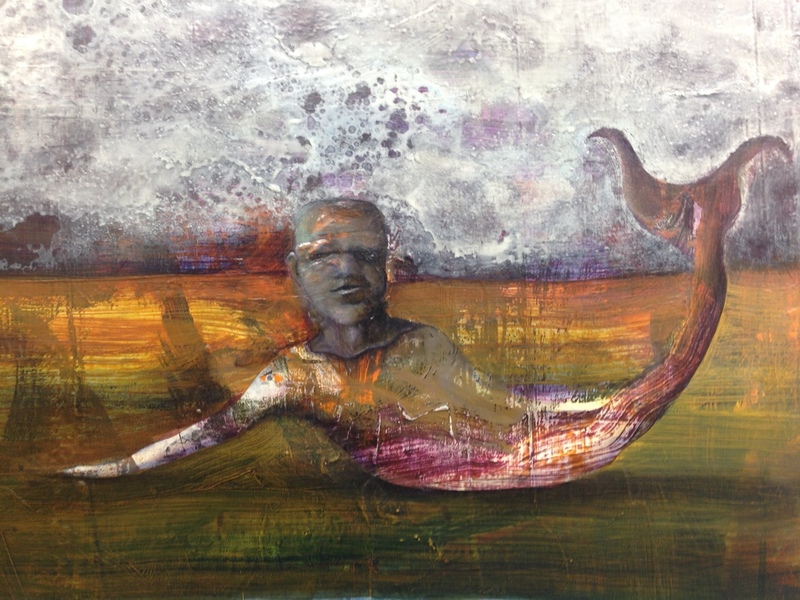 Identity is a theme that frequently finds its way in to the more figurative pictures...especially the Mermen series. In the abstract style I strive to achieve a personal language by contemplating relationships between shape, line, color and space. Sometimes the result appears meditative and sometimes more of a rumination. Editing can take years. History and artifact emerge as important features while I dig deeper to unearth fresh dirt by sanding and scraping away layers. Art Ltd. 09.09 DeWitt Cheng "Art of San Francisco"